....More chocolate!! Spring officially here. To celebrate, we made these delicious mini chocolate cupcakes with chocolate frosting! Spotted: Lola Pearl cupcakes at St. Francis High School! 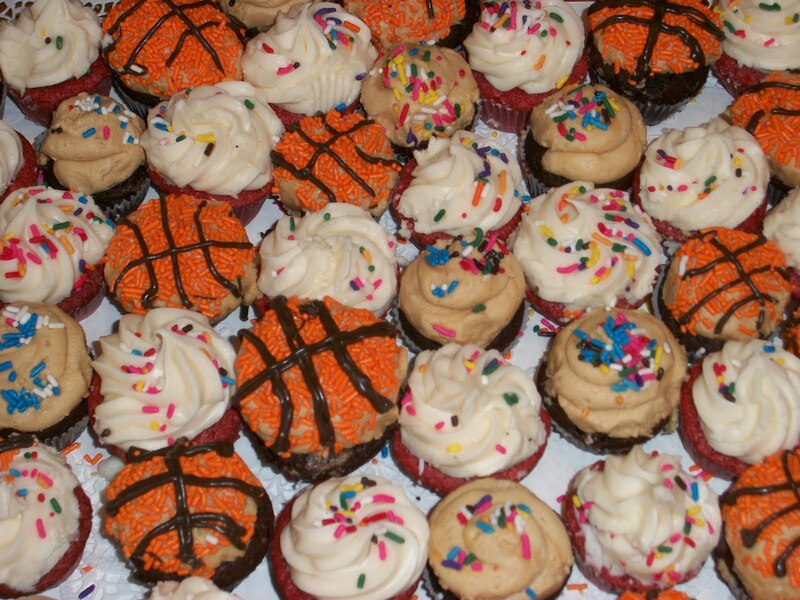 We loved making these “March Madness” cupcakes! We used orange jimmies and melted chocolate to create the basketballs and made backboards out of graham cracker and white chocolate (using gum drop strips for the basketball nets)! Shamrocks, "car bomb" cupcakes, homemade soda bread, oh my! Ohh, the luck of the Irish! We held our annual corned-beef and cabbage/Saint Patrick celebration dinner this weekend. It's always great to have a big group of your friends and loved ones over for an evening of food, drink and lots of laughs! To honor the tradition, we made homemade soda bread and "car bomb cupcakes" (chocolate Guinness cupcakes with Bailey's Irish Cream frosting, yumm!). Try this super delicious and EASY soda bread recipe! Combine the flour, baking soda, sugar, salt and cream of tartar in a large mixing bowl and mix well. Add the raisins and caraway seeds and mix well. Add enough buttermilk to make a dough, mixing with a fork until the ingredients are moistened. Turn the dough onto a lightly floured surface and knead for 1 to 2 minutes or until well mixed. Shape the dough into a large ball and place on a well-greased baking sheet. Flatten the dough into a 7-inch circle and cut an X that is 1/4-inch deep in the center of the circle. Bake at 375 degrees for 35 to 40 minutes or until the top is golden brown and the loaf sounds hollow when rapped with knuckles. Remove the loaf to a wire rack and brush with the melted butter. Let stand until completely cooled before slicing. Who doesn't love cherry blossoms? 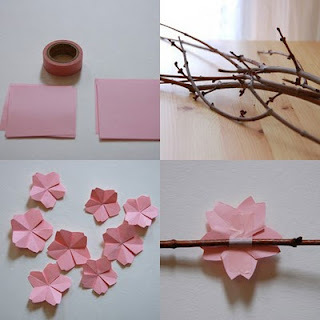 With some paper, tape and some twigs, you can add a spring twist in your domicile. We can't wait to try this DIY out! Why wait for an excuse? These added touches an adorable to way to bring spring inside! For instructions, click here! Not only did I have to come to terms with reaching for my own cupcake, I was disappointed in the available flavors. They had chocolate with vanilla or chocolate frosting, and vanilla with vanilla or chocolate frosting (in beautiful colors, yes), but the lack of equal counterparts (ie Red Velvet), left me wanting more. When I reached the cashier, I inquired innocently if they had other flavors, to which he replied: “Yes, but we’ve been experiencing a high volume ever since this morning. Our other locations may have different flavors”. This left me confused. How does a bakery reference a high volume in regards to why you do not have other flavors? Isn’t it someone’s job in the bakery to make the cakes, therefore reassuring the customers that they will have an ample supply of different varieties at any given point of the day?! I don’t want to be told (after waiting in line and serving myself) that if I went to another location, I would have been given (literally) a different variety of cakes! I ended up choosing the vanilla cupcake with chocolate frosting. I’ve been told the vanilla cakes say a lot about a cupcakery. While it was delicious, the whole experience left a bad taste in my mouth. This week’s highlighted cupcakes: Kokomo Coconut! Here is our beloved coconut cake with a festive spring nonpareil chocolate on a bed of coconut. As with all recipes, be sure to measure out all the ingredients before you begin your adventure into diy sponge candy. Timing is very important when working with melted sugar... Once the temp reaches 300, add the baking soda until incorporated transfer immediately into the prepared pan. The idea is to control the time that the mixture is in the heat (the pan). We often have discussions over the difficulty of certain baking techniques, but the truth is: READ THE RECIPE!! Don't go into anything blindfolded and don't let your excitement for the finished product cause you to rush! As Grandma Pearl recently said, "haste makes waste!" We encourage you to try your hand in making your own sponge candy! It will be a perfect gift and lovely surprise to celebrate the arrival of spring!